Figures released today by holiday home rental website Bookabach paints an interesting picture of how and where Kiwis spent their Christmas and New Year holidays. Over the two week holiday period between Friday 20 December and Sunday 5 January, Bookabach recorded 50,397 travellers visiting baches nationwide, with Northland (15.2%), Auckland (13.1%) and Coromandel regions (11.9%) topping the most popular list. The average total cost of a holiday was $1,084, and the average stay was 5.3 nights. Based on average cost per night, the most expensive holidays were recorded in Auckland ($251) and Queenstown-Lakes ($303), while the most affordable places were the West Coast of the South Island ($129) and Southland ($145). Bookabach General Manager Peter Miles says overall, recorded rental activity was up 30 percent on last year, with 39,656 adults and 10,741 children staying at rented baches over the holiday period. "You might think that most people want to get as far away from the big cities for as long as they can during the break, but we actually found the longest stays were happening in the Auckland region - which includes Waiheke Island. On average, bookings lasted nearly eight nights in Auckland. This is in contrast to the average stay in the Central Plateau region, just over three nights, and the national average of five nights per stay." "It was also interesting to see that the most expensive and most affordable places were neighbouring Queenstown and Southland. Queenstown Lakes had some of the priciest rentals thanks to the higher number of luxury offerings, while cribs in the West Coast and Southland were some of the best value in the country." 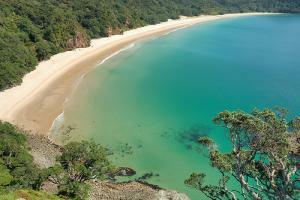 In terms of top ten destinations, Whangamata boasted the highest number of nights booked overall for the sixth year running, while Northland emerged as the most popular region overall. Bay of Plenty, Southland, Coromandel and the West Coast were the favourites for families with children. "On average, families on holiday in the Bay of Plenty had the highest number of children with them. Bookings in the region also tended to have the largest groups overall, with an average of 3.9 adults per booking, compared to just 2.5 in the Canterbury region." Miles concludes that the data could be useful for those who are already thinking about where to go next Christmas and New Year. "Provided you can get there easily, West Coast and Southland are two great options for budget-conscious holidaymakers." Who went? Who did they go with? How long did they stay for? $1,084 on average for the total stay.